In the last tutorial we have looked at physical memory management and even developed a full working physical memory manager. In this tutorial, we will take it to a new level by introducing paging and virtual memory. We will learn how we can mimic a full virtual address space for our programs and learn how we can manage virtual memory. This tutorial will build off of the physical memory manager we developed in the last chapter. This may also be the last chapter on memory management! With that in mind, lets get started! You might be curious as to why we should worry about this "virtual memory" thing. After all, we already have a nice and effective way of managing memory, right? Well, sort of. While it manages blocks of memory well, thats all our physical memory manager does. This alone is pretty useless, don't you think? There are alot of very important concepts that we should look at to better understand virtual memory and the need for it. Right now all we have is a way to directly and indirectly work with physical memory. There are alot of big problems with this that you may already know (or even have experience with yourself ;) ) One that we have just seen was when we would access to a block of memory that does not exist. Knowing that both programs and data are in memory, it is also possible for programs to access each others memory spaces, or even corrupt and overwrite themselves or other programs without knowing it. After all, there is no memory protection. Notice what is happening here. There is alot of unused memory between all of these programs and files. Okay...What happens if we add a bigger file that is unable to fit in the above? This is when big problems arise with the current scheme. We cannot directly manipulate memory in any specific way, as it will currupt the currently executing programs and loaded files. As you can see, there are alot of problems that will arise when working with physical memory. If your operating system is single-tasking (Where only one ring 0 program runs at a time), then this might be fine. For anything more complex, we will be needing more control over how memory works within the system. What we need is a way to abstract physical memory in such a way that we do not need to worry about these details anymore. I think you know where I am getting at here -- this is where virtualization comes in. Lets take a look! Understanding what virtual memory is can be a little tricky. Virtual Memory is a special Memory Addressing Scheme implimented by both the hardware and software. It allows non contigous physical memory to act as if it was contigius memory. Notice that I said "Memory Addressing Scheme". What this means is that virtual memory allows us to control what a Memory Address refers to. 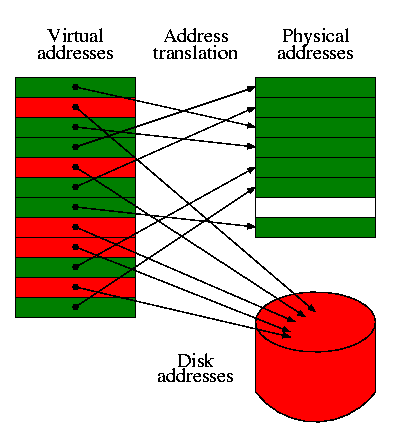 A Virtual Address Space is a Program's Address Space. One needs to take note that this does not have to do with Physical Memory. The idea is so that each program has their own independent address space. This insures one program cannot access another program, because they are using a different address space. Because VAS is Virtual and not directly used with the physical memory, it allows the use of other sources, such as disk drives, as if it was memory. That is, It allows us to use more "memory" then what is physically installed in the system. This fixes the "Not enough memory" problem. Also, as each program uses its own VAS, we can have each program always begin at base 0x0000:0000. This solves the relocation problems discussed ealier, as well as memory fragmentation--as we no longer need to worry about allocating continous physical blocks of memory for each program. Virtual Addresses are mapped by the Kernel trough the MMU. More on this a little later. The Memory Management Unit (MMU) (Also known as Paged Memory Management Unit (PMMU)) sets between (Or as part of) the microprocessor and the memory controller. While the memory controller's primary function is the translation of memory addresses into a physical memory location, the MMU's purpose is the translation of virtual memory addresses into a memory address for use by the memory controller. This means--when paging is enabled, all of our memory refrences go through the MMU first! This is a cache stored within the processor used to improve the speed of virtual address translation. It is useually a type of Content-addressable memory (CAM) where the search key is the virtual address to translate, and the result is the physical frame address. If the address is not in the TLB (A TLB miss), the MMU searches through the page table to find it. If it is found in the TLB, it is a TLB Hit. If the page is not found or invalid inside of the page table during a TLB miss, the processor will raise a Page Fault exception for us. Think of a TLB as a table of pages stored in a cache instead of in RAM--as that is basically what it is. Virtual Memory also provides a way to indirectly use more memory then we actually have within the system. One common way of approching this is by using Page files, stored on a hard drive or a swap partition. Virtual Memory needs to be mapped through a hardware device controller in order to work, as it is handled at the hardware level. This is normally done through the MMU, which we will look at later. Notice what is going on here. Each memory block within the Virtual Addresses are linear. Each Memory Block is mapped to either it's location within the real physical RAM, or another device, such as a hard disk. The blocks are swapped between these devices as an as needed bases. This might seem slow, but it is very fast thanks to the MMU. Remember: Each program will have its own Virtual Address Space--shown above. Because each address space is linear, and begins from 0x0000:00000, this immiedately fixes alot of the problems relating to memory fragmentation and program relocation issues. Each memory "Block" is known as a Page, which is useually 4096 bytes in size. We will cover Pages a little later. Okay, so a Page is a memory block. This memory block can either be mapped to a location in memory, or to another device location, such as a hard disk. This is an unmapped page. If software accessed an unmapped page (The page is not currently in memory), it needs to be loaded somehow. This is done by our Page fault handler. Because we are talking about paging in general, I think now would be a good idea to look at some extensions that may be used with paging. Lets have a look! PSE is a feature in x86 microprocessors that allows pages more then 4KB in size. This allows the x86 architecture to support 4MB page sizes (Also called "huge pages" or "large pages") along side 4KB pages. Woo-hoo! Welcome to the wonderful and twisted-minded world of paging! With all of the fundemental concepts that we have went over already, you should have a nice and good grasp at what paging and virtual memory is all about. This is a great start, don't you think? Okay, cool...but, how do we actually impliment it? How does paging work on the x86 architecture? Lets take a look! The i86 architecture uses a specific format for just this. It allows us to keep track of a single page, and where it is currently located at. Lets take a look..
A page table entry is what represents a page. We will not cover the page table until a little later so dont worry too much about it. However we will need to look at what an entry in the table looks like now. The x86 architecture defines a specific bit format for working with pages, so lets take a look at it. Quite possibly the most important thing here is the frame address. The frame address represents the 4KB physical memory location that the page manages. This is vital to know when understanding paging, however it is hard to describe why it is so right now. For now, just remember that each and every page manages a block of memory. If the page is present, it manages a 4KB physical address space in physical memory. The Dirty Flag and Access Flag are set by the processor, not software. You might wonder on how the processor knows what bits to set; ie, where they are located in memory. We will look at that a little later. Just rememeber that, this will allow the software or executive to test if a page has been accessed or not. The present flag is an important one. This one single bit is used to determin if a page is currently in physical memory or not. If it is currently in physical memory, the frame address is the 32 bit linear address for where it is located at. If it is not in physical memory, the page must reside on another location--such as a hard disk. If the present flag is not set, the processor will ignore the rest of the bits in the structure. This allows us to use the rest of the bits for whatever purpose...perhaps where the page is located at on disk? This will allow--when our page fault handler gets called--for us to locate the page on disk and swap the page into memory when needed. Lets give out a simple example. Lets say that we want this page to manage the 4KB address space beginning at physical location 1MB (0x100000). What this means--to put in other words--is that this page is "mapped" to address 1MB. Notice that 0x100000 is 4KB aligned? It ORs it with 3 (11 binary which sets the first two bits. Looking at the above table, we can see that it sets the present and read/write flags, making this page present (Meaning its in physical memory. This is true as it is mapped from physical address 0x100000), and is writable. Thats it! You will see this example expand further in the next few sections so that you can start seeing how everything fits in, so don't worry to much if you still do not understand. The demo hides all of the code to set and get the individual properties of the page table entries inside of these two files. All these do is set and get the bits and frame address from the 32 bit pattern that we have looked at in the list above. This interface does have a little overhead but greatly improves readability and makes it easier to work with them. Notice how this matches up with the bit format that we looked at in the above list. What we want is a way to abstract the setting and getting of these properties (ie, bits) behind the interface. pt_entry_add_attrib() sets a single bit within the pt_entry. We pass it a mask (like our I86_PTE_PRESENT bit mask) to set it. pt_entry_del_attrib() does the same but clears the bit. pt_entry_set_frame() masks out the frame address (I86_PTE_FRAME mask) to set our frame address to it. pt_entry_pfn() returns this address. Okay, this is great as this setup allows us to keep track of a single page. However, it is useless by itself as a typical system will need to have alot of pages. This is where a page table comes in. A Page Table is..well..a table of pages. (Surprised?) A page table allows us to keep track of how the pages are mapped between physical and virtual addresses. Each page entry in this table follows the format shown in the previous section. In other words, a page table is an array of page table entries (PTEs). Thats an example of a page table. Notice how it is nothing more then an array 1024 page entries. Knowing that each page manages 4KB of physical memory, we can actually turn this little table into its own virtual address space. How can we do this? Simple: By deciding the format of a virtual address. What we are now doing is an example of address translating. We are actually translating this virtual address to see what physical location it refers to. The page table index, 11000000b = 192. This is the page entry inside of our page table. We can now get the base physical address of the 4KB that this page manages. If this page is present (Pages present flag is set), all we need to do is access the pages frame address to access the memory. If this page is NOT present, then generate a page fault--The page data might be somewhere on disk. The page fault handler will allow us to copy the 4KB data for the page into memory somewhere and set the page to present and update its frame address to point to this new 4KB block of physical memory. Okay okay, I know. This little example of creating a fake "virtual address" might seem silly, but guess what? This is how its actually done! The actual format of a virtual address is a little bit more complex in that there are three sections instead of 2. However, if we omit the first section of the real virtual address format then it would be exactally the same as our above example. I hope by now you are starting to see how everything fits together, and the importance of page tables. A system with smaller page sizes will require more pages then a system with larger page sizes. Because the table keeps track of all pages, a system with smaller page sizes will also require a larger page table because there are more pages to keep track of. Simple enough, huh? The i86 architecture supports 4MB (2MB pages if using Page Address Extension (PAE)) and 4KB sized pages. The important things to note are: Notice how page size may effect the size of page tables. Okay... We are almost done! A page table is a very powerful structure as you have seen. Remember our previous virtual address example? I gave an example of a virtual addressing system where each virtual address was composed of two parts: A page table entry and a offset into that page. On the x86 architecture, the virtual address format actually uses three sections instead of two: The entry number in a page directory table, the page table index, and the offset into that page. Page directory entries help provide a way to manage a single page table. Not only do they contain the address of a page table, but they provide properties that we can use to manage them. You will see how all of this fits in within the next section, so dont worry if you dont understand it yet. Page directory tables are very simularly structured in the way page tables are structured. They are an array of 1024 entries, where the entries follow a specific bit format. The nice thing about the format of page directory entries (PDEs) is that they follow almost the exact same format that page table entries (PTEs) do (in fact they can be interchangeable). There is only a few little bit of details (pun intended ;) ). Alot of the members here should look familiar from the page table entry (PTE) list that we looked at ealier. The Present, Read/Write, and access flags are the same as it was with PTEs, however they apply to a page table rather then a page. page size determins if the pages inside of the page table are 4KB or 4MB. Page Table Base address bits contain the 4K aligned address of a page table. Simular to what we did with PTEs, we have created an interface to abstract PDEs in the same manner. The Page Directory Table is sort of like an array of 1024 page tables. Remember that each page table manages 4MB of a virtual address space? Well... Putting 1024 page tables together we can manage a full 4GB of virtual addresses. Sweet, huh? Okay, its a little more complex then that, but not that much. The Page Directory Table is actually an array of 1024 page directory entries that follow the format above. Look back at the format of an entry and notice the Page Table Base address bits. This is the address of the page table this directory entry manages. Notice what is happening here. Each page directory entry points to a page table. Remember that each page manages 4KB of physical (and hence virtual) memory? Also, remember that a page table is nothing more then an array of 1024 pages? 1024*4KB = 4MB. This means that each page table manages its own 4MB of address space. Each page directory entry provides us a way to manage each page table much easier. Because the complete page directory table is an array of 1024 directory entries, and that each entry manages its own table, we effectivly have 1024 page tables. From our previous calculation we know each page table manages 4MB of address space. So 1024 page tables*4MB size= 4GB of virtual address space. I guess thats it for ... believe it or not... everything. See, its not that hard, is it? In the next section, we will be revisiting the real format of an x86 virtual address, and you will get to see how everything works together! We run into a small problem here. Remember that a page directory table represents a 4GB address space? How can we allow multiple programs a 4GB address space if we can only have one page directory at a time? We have covered everything we need to develop a good virtual memory manager. A virtual memory manager must provide methods to allocate and manage pages, page tables, and page directory tables. We have looked at each of these in separate, but have not looked at how they work together. A Higher Half Kernel is a kernel that has a virtual base address of 2GB or above. A lot of operating systems have a higher half kernel. Some examples include the Windows and Linux Kernels. The Windows Kernel gets mapped to either 2GB or 3GB virtual address (depending on if /3gb kernel switch is used), the Linux Kernel gets mapped to 3GB virtual address. The series uses a higher half kernel mapped to 3GB. Higher half kernels must be mapped properly into the virtual address space. There are several methods to achieve this, some of which is listed here. You might be interested on why we would want a higher half kernel. We can very well run our kernel at some lower virtual address. One reason has to do with v86 tasks. If you want to support v86 tasks, v86 tasks can only run in user mode and within the real mode address limits (0xffff:0xffff), or about 1MB+64k linear address. It is also typical to run user mode programs in the first 2GB (or 3GB on some OSs) as software typically never has a need to access high memory locations. The first design is that we can have the boot loader set up a temporary page directory. With this, the base address of the kernel can be 3GB. The boot loader maps a physical address (typically 1MB) to this base address and calls the kernel's entry point. This method works, but creates a problem of how the kernel is going to work with managing virtual memory. The kernel can either try to work with the page directory and tables set up by the boot loader, or create a new page directory to manage. If we create a new page directory, the kernel will need to remap itself (1MB physical to the base virtual address of the kernel) or cloning the existing temporary page directory to the new page directory. At this time, this is the method the series uses. The series boot loader will set up a temporary page directory and maps the kernel to 3GB virtual. The kernel then creates a new page directory during VMM initialization and remaps itself. The kernel must remain position-independent during this set up phase. This is the method we use in our in-house OS. Another possible design is that the boot loader loads the kernel into a physical memory location and keeps paging disabled. The kernel virtual base address would be the virtual address it is supposed to execute at. For example, the boot loader can load and execute the kernel at 1MB physical, although the kernels base address is 3GB. This method is a little tricky. There has to be a way for the boot loader to know what physical address to load and execute the kernel at, and the kernel has to map itself to its real base virtual address. This is usually done during kernel startup in position-independent code. This can be used in position-dependent code, but the kernel must be able to fix the addresses when accessing data or calling functions. This is the method used in our in-house OS. This method uses Tim Robinson's GDT trick. This can be found in his documentation located here (*.pdf) This allows your kernel to run at a higher address (its base address) even though it is not loaded there. This trick works do to address wrap around. For example, lets say our kernel is loaded at 1MB physical address, but we want it to appear to be running at 3GB Virtual. The base that we want is X + 3GB = 1MB in this case. Lets look closer. Remember that the GDT descriptor base address is a DWORD. If the value becomes greater then 0xffffffff, it will wrap around back to 0. 3GB = 0xC0000000. 0xffffffff - 0xc0000000 = 0x3FFFFFFF bytes left until it wraps. We need to add an address that will make this address to point to our physical location (1MB). Knowing we have 0x3FFFFFFF bytes left until our DWORD wraps back to 0, we can add 0x100000 (1MB) + 0x3FFFFFFF = 0x400FFFFF + 1 = 0x40100000. So, by using the above example, if our kernel is loaded at 1MB physical address but has a real base address of 3GB virtual, we can create a temporary GDT with a base code and data selector of 0x40100000. The processor automatically adds the base selector addresses to the addresses it is accessing. After using LGDT to install this new GDT. After this we are now running at 3GB. This works because the processor will add the cs and ds selector base (40100000) to whatever address that is being referenced. For example, 3GB would be translated by the processor to 1MB in our example as 3GB+base selector ((40100000) = 1MB physical. This trick is fairly easy to impliment and works well but wont work for 64 bit (Long Mode). After the kernel performs this trick it can set up its page directory and map itself with ease after which can enable paging. When we enable paging, all memory refrences will be treated as a virtual address. This is very important to know. This means we must set up the structures properly first before enabling paging. If we do not, we can run into an immiedate triple fault--with or without valid exception handlers. This is very important! This tells the processor (And *us*) alot of information. The directory index portion tells us what index into the current page directory to look in. Look back up to the Directory Entry Structure format in the previous section. Notice that each directory table entry containes a pointer to a page table. You can also see this within the image again in that section. Because each index within the directory table points to a page table, this tells us what page table we are accessing. The page table index portion tells us what page entry within this page table we are accessing. ...And remember that each page entry manages a full 4KB of physical address space? The offset into page portion tells us what byte within this pages physical address space we are refrencing. Notice what happened here. We have just translated a virtual address into a physical address using our page tables. Yes, its that easy. No trickery involved. Remember that the directory index tells us what page table we are accessing within the page directory table? So... 1100000000b (The directory index) = 768th page table. Remember that the page table index is the page we are accessing within this page table? That is 0, so its the first page. Also note the offset byte in this page is 0. Now, all we need to do is set the frame address of the first page in the 768th page table to 0x100000 and voila! You have just mapped 3GB virtual address to 1MB physical! Knowing that each page is 4KB aligned, we can keep doing this in increments of 4KB physical addresses. Identity Mapping is nothing more then mapping a virtual address to the same physical address. For example, virtual address 0x100000 is mapped to physical address 0x100000. Yep--Thats all there is to it. The only real time this is required is when first setting up paging. It helps insure the memory addresses of your current running code of where they are at stays the same when paging is enabled. Not doing this will result in immediate triple fault. You will see an example of this in our Virtual Memory Manager initialization routine. I suppose that is everything. What we will look at next is the virtual memory manager (VMM) itself that has been developed for this tutorial. This will bring everything that we have looked at together so that you can see how everything works. I have tried to make the routines small so that we can focus on one topic at a time as there is a couple of new things that we still need to look at. PAGE_DIRECTORY_INDEX, PAGE_TABLE_INDEX, PAGE_GET_PHYSICAL_ADDRESS are macros that just returns the respective partion of a virtual address. Remember that a virtual address has a specific format, these macros allow us to obtain the information from the virtual address. PTABLE_ADDR_SPACE_SIZE represents the size (in bytes) that a page table represents. A page table is 1024 pages, where a page is 4K in size, so it is 1024 * 4k = 4MB. DTABLE_ADDR_SPACE_SIZE represents the number of bytes a page directory manages, which is the size of the virtual address space. Knowing a page table represents 4MB of the address space, and that a page directory contains 1024 page tables, 4MB * 1024 = 4GB. The virtual memory manager presented here does not handle large pages. Instead, it only manages 4K pages. The Virtual Memory Manager (VMM) we use relies on these structures heavily. Lets take a look at some of the routines in the VMM to learn how they work. Notice how our PTE routines make this much easier to do? The above sets the PRESENT bit in the page table entry and sets its FRAME address to point to our allocated block of memory. Thus the page is present and points to a valid block of physical memory and is ready for use. Cool, huh? Also, notice how we "map" the physical address to the page. All this means is that we set the page to point to a physical address. Thus the page is "mapped" to that address. Now that we have a way of abtaining the page table entry number from a virtual address, we need a way to get it from the page table. This routine does just that! It uses the above function to convert the virtual address into an index into the page table array, and returns the page table entry from it. Because this routine returns a pointer, we can modify the entry as much as we need to as well. Cool? Next up...The page directory routines! Notice how small all of these routines are. They provide a minimal but very effective interface for easily working with page tables and directories. When we set up a page directory, we need to provide a way to install it for our use. In the previous tutorial, we added two routines: pmmngr_load_PDBR() and pmmngr_get_PDBR() to set and get the Page Directory Base Register (PDBR). This is the register that stores the current page directory table. On the x86 architecture, the PDBR is the cr3 processor register. Thus, these routines simply set and gets the cr3 register. Remember how the TLB caches the current page table? Sometimes it may be necessary to flush (invalidate) the TLB or individual entries so that it can get updated to the current value. This may be done automatically by the processor (Like during a mov instruction involving a control register). The processor provides a method for us to manually flush individual TLB entries ourself. This is done using the INVLPG instruction. Keep in mind that INVLPG is a privlidged instruction. Thus you must be running in supervisor mode to use it. The first thing the above does is to allocate a new page for the new page table and clears it. After words, it uses PAGE_DIRECTORY_INDEX() again to get the directory index from the virtual address, and indexes into the page directory to get a pointer to the page table entry. Then it sets the page table entry to point to our new allocate page table, and sets its PRESENT and WRITABLE bits so that it can be used. The above calls PAGE_GET_PHYSICAL_ADDRESS() to get the physical frame that the page directory entry points to in order to get the page table entry. Then, using PAGE_TABLE_INDEX to get the page table index from the virtual address, indexing into the page table it obtains the page table entry. Then it sets the page to point to the physical address and sets the pages PRESENT bit. This is an important routine. This uses all of the above routines (Well, most of them ;) ) to set up the default page directory, install it, and enable paging. We can also use this an example of how everything works and fits together. Because this routine creates a new page directory, we also need to map 1MB physical to 3GB virtual in order for the kernel. Remember how page tables must be located at 4K aligned addresses? Thanks to out physical memory manager (PMM), our pmmngr_alloc_block() already does just this so we do not need to worry about it. Because a single block allocated is already 4K in size, the page table has enough storage space for its entries as well (1024 page table entries * 4 bytes per entry (size of page table entry) = 4K) so all we need is a single block. Afterwords we clear out the page table to clean it up for our use. This parts a little tricky. Remember that as soon as paging is enabled, all address become virtual? This poses a problem. To fix this, we must map the virtual addresses to the same physical addresses so they refer to the same thing. This is idenitity mapping. The above code idenitity maps the page table to the first 4MB of physical memory (the entire page table). It creates a new page and sets its PRESENT bit followed by the frame address we want the page to refer to. Afterwords it converts the current virtual address we are mapping (stored in "frame") to a page table index to set that page table entry. This code is pretty much the same as the above loop and maps 1MB physical to 3GB virtual. This is what maps the kernel into the address space and allows the kernel to continue running at 3GB virtual address. The above creates a new page directory and clears it for our use. Remember that each page table represents a full 4MB virtual address space? Knowing that each page directory entry points to a page table, we can saftley say that each page directory entry represents the same 4MB address space inside of the 4GB virtual address space of the entire directory table. The first entry in the page directory is for the first 4MB, the second is for the next 4MB and so on. Because we are only mapping the first 4MB right now, all we need to do is set the first entry to point to our page table. In a simular way, we set up a page directory entry for 3GB. This is needed so we can map the kernel in. Notice that we also set the page directory entries PAGE and PRESENT bit as well. This will tell the processor that the page table is present and writable. Now that the page directory is set up, we install the page directory and enable paging. If everything worked as expected, your program should not crash. If it does not work, it will probably triple fault. As you know, as soon as we enable paging all addresses become virtual. All of these virtual addresses rely heavily on the page tables and page directory data structures. This is fine, but there will be alot of times when a virtual address requires the cpu to access a page that is not yet valid. This is when a page fault exception (#PF) is raised by the processor. A will only occur when a page is marked not present. A General Protecton Fault (#GPF) will occur if the page is not properly mapped but marked present and accessable. A #GPF will also occur if the page is not accessable. All other bits are 0. When a #PF occures, the processor also stores the address that caused the fault in the CR2 register. Normally when a #PF occurs, an operating system will need to fetch the page from the faulting address of the currently running program from disk. This requires several different components of an OS (disk driver, file system driver, volume/mount points management) that we do not yet have. Because of this, we will return back to page fault handling a little later when we have a more evolved OS. This demo includes all of the source code in this tutorial, and more. This demo includes paging code inside of the bootloader and kernel to include the complete virtual memory manager (VMM) and to map the kernel to the 3GB mark within its own virtual address space.